Mobile fans know that smartphones can do a lot of things -- they can access the internet or e-mail, text or call friends, listen to music, watch movies, play games, and more. What they can't do, however, is entertain more than two people at once, particularly and especially with devices running smaller displays. Luckily, this problem can be directly addressed by the Capsule, a miniature smart-enabled Bluetooth speaker and projector combo that allows users to cast images from their smart devices on a screen up to 100" in size. Weighing only 14 ounces and running the latest version of Android, Capsule also works as a fully-functioning Android device with its included remote and Wi-Fi capabilities, and can be an ideal way to watch videos or play music in lavish style regardless of current location. 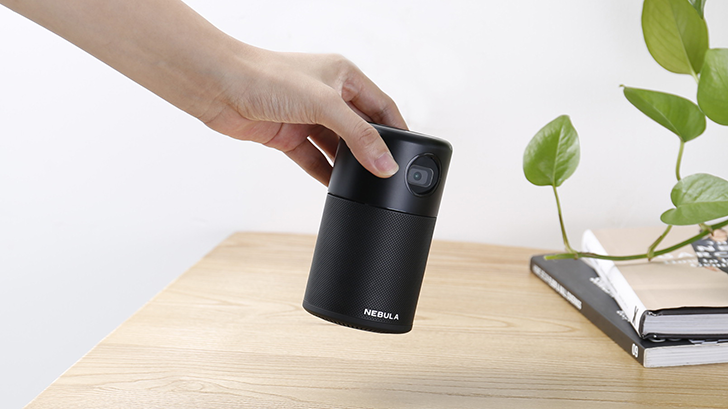 Developed as a joint project between engineering firm Nebula and popular battery backup manufacturer Anker, the Capsule projector packs some serious tech into a small form factor. Only about as big as a can of soda, the Capsule is 4.72" in height and 2.67" in diameter. Packed inside its housing is a 0.2" FWVGA DLP projector running at a native resolution of 854x480. Though the resolution isn't exactly staggering, the Capsule is able to reach a brightness of 100 ANSI lumens, and can clearly project an image up to 100" across in a dimly-lit room. Nebula also says the Capsule is able to deliver a clear 60 inch screen in neutral light conditions, which is still plenty of screen real estate for most functions. The rest of the unit is no slouch, either: the Capsule has an estimated lamp life of 30,000 hours, runs Android version 7.0, has an omni-directional 5-watt speaker, and is powered by a Quad Core A7 CPU paired together with an Adreno 304 GPU and 1GB of DDR3 RAM. The device also supports Bluetooth and HDMI connections, and its internal battery can support around two and a half hours of continuous video play or around 40 hours of continuous music playback through Bluetooth. Where Can You Buy A Capsule Projector? When Is It Expected To Ship? Though the early bird Indiegogo specials have all been snatched up, interested buyers still have a chance to pick up a Capsule projector over on the product's Indiegogo page. The current deal is 22% off the estimated $349 retail price, which means the unit can be purchased for $269. Other bundles are available with greater discounts, including a $299 package that offers a carrying case and tripod as well as one that includes an additional Anker-branded battery backup. After a long and successful campaign so far, Nebula will be finally ready to enter mass production with the Capsule next month. That's the plan, anyway -- according to the project's official timeline, mass production will begin in November, with delivery anticipated in December. This means the Nebula Capsule should be out just in time for the holidays. A projector would make a great gift for any die-hard mobile fan. To discover more great mobile accessories and other gift ideas, be sure to check out Modojo's Best Accessories homepage.